The Independent Order of Oddfellows (I.O.O.F.) 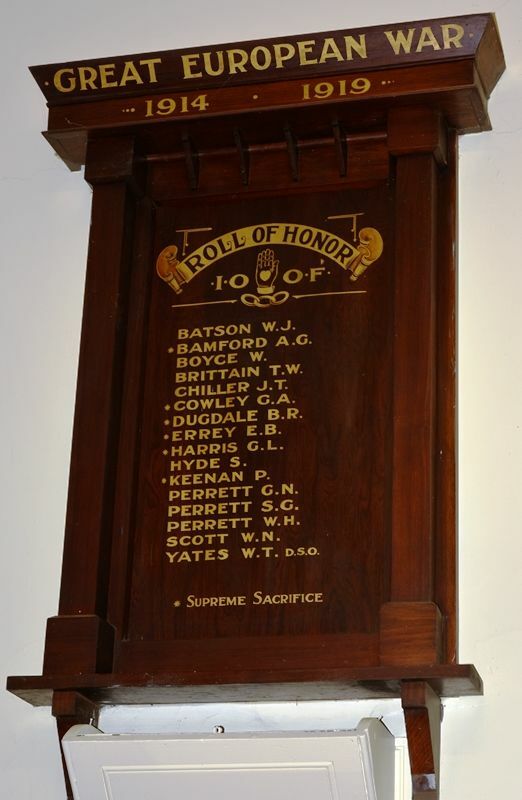 honour roll commemorates those who served in World War One. At the invitation of the Camperdown Independent Order of Oddfellows' Lodge a large number of the members of the Order, together with their kith and kin, and representatives of sister lodges and kindred societies, assembled at the Oddfellows' Hall on Tuesday evening to participate in a social funcion having for its object the welcoming back to Camperdown of the brethren who had returned from the war and to unveil the honor board. The chair was occupied by the secretary of the Lodge, Bro.Jas. A. Collie, who extended a hearty welcome to the General Secretary of the Grand Lodge, Bro. C. E. Wilson, and to the various representatives of district lodges and kindred societies. On behalf of the Lodge he thanked those members who had so willingly given their services to fight the battle on behalf of the Empire. Nine of the 16 who had gone overseas had returned, and there was one other who had gone to America, and had not yet returned. Six of the brethren had paid the supreme sacrifice, and he felt it was his duty to express, on behalf of the Lodge, his sympathy with the relatives of the men who had played their part so nobly. At the invitation of the chairman, the returned members present took their seats on the platform, to the accompaniment of cheers. Excerpt from Camperdown Chronicle (Vic. ),13 May 1920.